The Old Bailey Proceedings Online are a rich research resource, making available a fully searchable, digitised collection of all surviving editions of the Old Bailey Proceedings from 1674 to 1913, and of the Ordinary of Newgate’s Accounts between 1676 and 1772. It allows access to over 197,000 trials and biographical details of approximately 2,500 men and women executed at Tyburn. Access is available free of charge for non-commercial use. 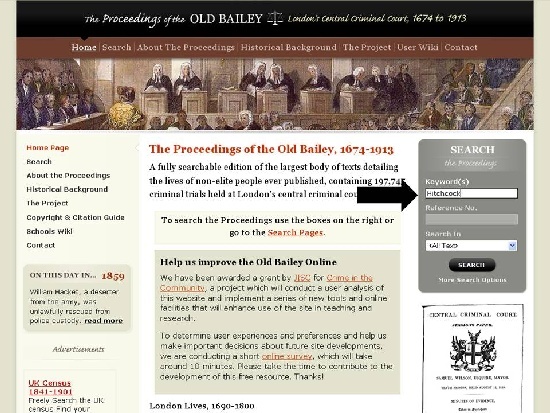 In addition to the text, accessible through both keyword and structured searching, the website provides digital images of all 190,000 original pages of the Proceedings, 4,000 pages of Ordinary’s Accounts, advice on methods of searching this resource, information on the historical and legal background to the Old Bailey court and its Proceedings, and descriptions of published and manuscript materials relating to the trials covered. Full details about the project which was developed through a collaboration between the Universities of Hertfordshire and Sheffield and the Open University, and was funded by the Arts and Humanities Research Council and the Big Lottery Fund is available online. If your research relates to historical issues of crime, justice or punishment then you will want to explore this resource. You can search by name and also by crime, verdict or punishment. Online research guides are available to help you search effectively. The Getting Started guide will help you jump in and start exploring. The trials contain much information of relevance to social and cultural historians as well as legal and criminological scholars. This entry was posted in Criminology, E-Resources, Law on 16th Oct, 2015 by Lee Snook.